Run-time only installation – The run-time only installation installs Pega Robotic Automation Runtime. Studio installation – The studio installation installs both Pega Robotic Automation Studio and Pega Robotic Automation Runtime. 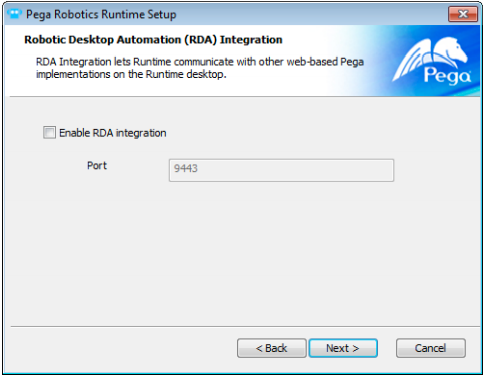 The Pega Robotic Automation Runtime installation wizard automatically configures many of the typical settings needed to run automations from your Pega Platform application. During the installation process, you are prompted to enable robotic desktop automation (RDA). You must select the Enable RDA integration check box to invoke automations from your Pega Platform application. Activate and configure a locally-hosted REST service that is responsible for responding to automation requests from your Pega Platform application. Automatically install the localruntime.pega.com SSL security certificate to your Local Computer, Personal Certificates store, and bind the certificate to the port specified during installation. The default port is 9443. Add a new certificate each year and include it in the latest Pega Robotic Automation Runtime release to ensure that the installed certificate never expires on a customer computer. The current SSL certificate expires on July 26, 2019. Changing the port after you have completed the installation wizard requires rebinding the SSL certificate to the new port. For more information, see Changing the Pega Robotic Automation Runtime port after installation. If you change this system setting, you are required to re-save all flow actions that include automation invocations. Using a command line parameter during a silent installation. Directly editing the allowedOrigins setting inside the <Robotics> block of the RuntimeConfig.xml file. You also configure Robotic Processing Automation (RPA) in the RuntimeConfig.xml file. Specify the URL of the Pega Platform server that robotic virtual machines (VMs) use to communicate with a user's Pega Platform application, for example, PegaServer baseUrl=“http://<MYPEGASERVER>:<PORT>/prweb/api/v1/” />. For more information about the RuntimeConfig.xml file, see Runtime Configuration Settings XML File. Pega Robotic Automation Studio communicates with your Pega Platform development environment to fetch the properties defined in your application. After these properties are imported, an automation developer can use those properties in the design-time authoring. The exact set of properties pulled into Pega Robotic Automation Studio is controlled by the set of relevant records defined for each Pega class or case type. You can manage relevant records from the Relevant Records landing page in Designer Studio. In addition to the port information, the Pega Robotic Automation Studio installation wizard prompts you to enter the connection URL to your Pega Platform development environment and a valid user name and password through which to connect to that environment. Properties from your development environment are fetched through the Pega API. Ensure that the Pega operator specified above belongs to an access group with the PegaRULES:PegaAPI access role. The port setting in the Robotics section of the RuntimeConfig.XML file. The DesktopRoboticsURL Dynamic System Setting in your Pega application. You can install Pega Robotic Automation Studio and Pega Robotic Automation Runtime through the command line. You can also use the /q or q/+ switch to perform a silent installation.